An aside, I am learning Spanish and I asked a Spanish speaker whether it would be correct to refer to a shepherd as El Pastor. She laughed and started to tell me it was rotisserie pork from Mexico City. Yes, I know that, but I want to know what to call the guy herding sheep! Having eaten quite a few al pastor tacos in Mexico, for some odd reason, I never questioned why something made with pork was "shepherd style". 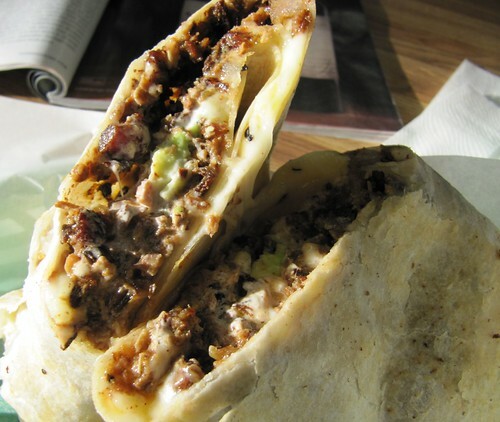 According to the internet (the best source for completely unsubstantiated rumor and anecdotal evidence), al pastor in Mexico city is derived from lamb shawarma cooking brought by Lebanese immigrants to Mexico city. Shepherd style is a reference to the lamb used in the original dish. You've been late to the party. They're not the greatest or the cheapest, but fresh ingredients, and no rice only beans in the burrito. They make a great lengua burrito, yum. @H - I'll have to try the lengua. I'd love to hear your suggestions for the greatest, as I haven't been eating much Mexican food in SF in the past few years.